Elyse: We’re going to talk about the Ile de la Cité in Paris today. It is this small island in the center of the Seine river (the river that cuts the city of Paris in half) and Ile de la Cité is famous because it has two of the most famous monuments of Paris and also because it is literally the place where the city began. Annie: Why do you start your visit of Paris there Elyse? Elyse: Well, I didn’t at first, but I think it’s a really good introduction to the city of Paris, especially for people that have several days to visit Paris. So this is the place where city began, it is where the first settlers were, it’s where the Romans came in 50 BC to establish what became the city of Paris. 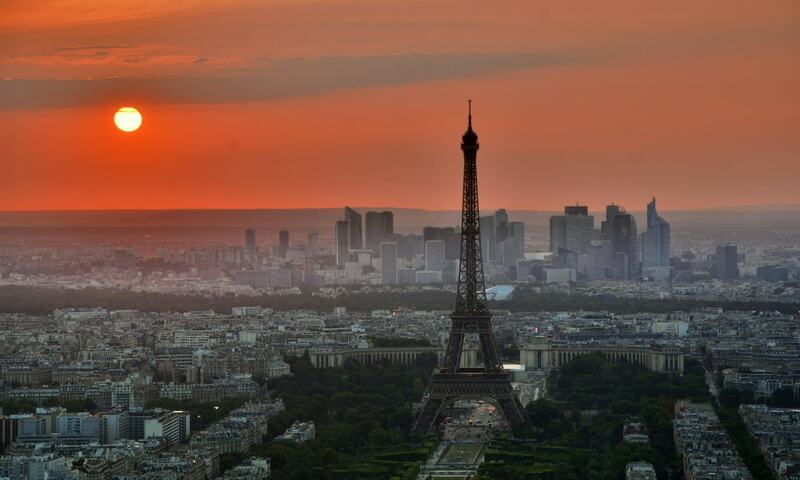 It’s a place from which you can get a great view of the city of Paris. You can see up and down the Seine river, and you can see both the right bank and the left bank which are the areas of Paris nearest the Ile de la Cité, and you get a really good sense of how the city developed there. Not only that but you can walk around and you can get great views all over. So besides the historical monuments, it’s a really great place to visit. Elyse: Right, they are both on Ile de la Cité. So maybe I’ll just mention the names of a few of the things that are on the island: there are four monuments you can visit on the Ile de la Cité. The biggest and most famous is the Cathedral of Notre Dame, famous not only in general for the history of architecture, but also the Hunchback of Notre Dame, Les Misérables, everyone knows about Notre Dame Cathedral. There is also the wonderful Sainte Chapelle which is a wonderful private chapel that is filled of the most wonderful stained glass, and as you said we’ll do a special podcast about those two monuments because they’re so important and there’s so much to say about those. And besides those two there are two more things you can visit on Ile de la Cité and one of them is an archeological crypt that is underground. You get into it through access on the Esplanade in front of the Cathedral of Notre Dame and it’s basically something that has been developed more recently where they’re showing the vestiges of antique ancient Paris that have been dug up, there is more and more archaeological work being done in the recent past, they have models of the city through the ages so you can see how it grew and developed. It’s fun to see especially if you’re interested in the ancient past and the archeology and you want to see some of the materials that they used that they have on display there. And then the other monument that is good to see if you’ve already seen other things, is the Conciergerie. It is next to the Sainte Chapelle and is a monument to the history of France today but was the first huge palace of French kings in the early medieval times. It’s huge and it’s got these wonderful pointy steeple towers that are very reminiscent of the towers you see on the castle in Disneyland, on drawings and cartoons, but it’s also a place where you will learn a lot about the history of Paris and the history of the kings. It’s also very significant in the more recent history of France because it’s where the last king and queen of France were held as prisoners and so there’s a whole part of the Conciergerie which is devoted to the history of the French Revolution, and that was a huge event in the history and the mind still of French people. So all together we have four monuments on the Island (Ile de la Cité). But besides those four monuments there are two parks that you can go visit, and you have the flower market that is open six days a week, from 8 am to 7 pm and it’s known for being a wonderful place to get potted plants and cut flowers and people come from all over the city to go there. Annie: So tell me Elyse, how easy or difficult is this visit? Elyse: Well, if you’re just going to walk around the island it’s perfectly easy because it’s flat, there are no steps. If you go into the church (Notre Dame) it’s relatively easy as well, unless you want to climb the tower. The tower is a separate entrance, not inside the Cathedral, you have to actually stand on line and pay to get in, and it’s for the hardy and those with good legs because it’s 380 steps up to the top. But if you want to see where the huntchback of Notre Dame lived and where he rang the bells, that’s where you have to go. It’s also where you get one of the greatest views of the city of Paris you could possibly imagine. But that’s for people who can make 380 steps without any trouble. Annie: And they’re probably narrow steps too. Elyse: They’re narrow steps, it’s a medieval stair case. One of the things that’s interesting and I’m glad you mentioned that because this will come up again and again, but just a quick reminder: if you’re in a medieval building, very often the stair cases are quite narrow, so you have to think whether or not you’re claustrophobic, because once you start going up one of those cork screw stair cases, you have to go all the way up to the top and use another stair case to go down usually. So you can’t just go oops I think I made a mistake and turn around half way up. Annie: I enjoy taking photographs. Are there places in particular you should go on Ile de la Cité to take pictures? Elyse: I would say the two end points of the island, and also on the little foot bridge that is right next to the entrance of Notre Dame. There are actually three bridges on each side of the island connecting either to the left bank or the right bank of Paris. Two of those bridges are foot bridges, no cars, so if you stand on them with a camera you can take photos of the old city, of boats. This is not high up, of course if you want photos high up the best thing is to go to the top of the tower, or you can also take photos from the balcony of the Sainte Chapelle. But pretty much anywhere on Isle de la Cité you have great views of the classical areas of Paris, so it’s a good place to take photos. Annie: So let me stop you for just a second so you can tell me where to find the good bathroom you were mentioning before on Ile de la Cité. Elyse: Remember I told you there were two lovely parks on Ile de la Cité. One is a lovely flowery park behind Notre Dame, so it’s the back end or Eastern side of Ile de la Cité. If you circle around the back of the Cathedral and go through the park, you have to go through walled gates, inside on the left side there are public free toilets that are very clean and accessible to all. And they are open as long as the park is open, which is until sun down every day. Now there’s another little park on the island. It’s on the front tip or the western end, it’s shaped like a triangle, it’s just like the prow of a ship, and it’s known in Paris as a place where students go to study and if they’re with their dates sometimes they watch the boats go back and forth on the river Seine (romantic). And that little park is called Le Vert Galant which means the Galand Green Square. And it was named that by a king, the king that actually made this little island a fashionable place, he was a king named Henry IV who was a ladie’s man. In French the word “galant” which has to do with seducing ladies, and he apparently had a house there that he used whenever he wanted to bring somebody, so it became the square that became the “galant” square. Annie: And if you’re on Ile de la Cité at meal time and you’re hungry, where would you go eat? Where would you suggest? Elyse: What I would suggest is one of the Café Brasserie next to Notre Dame or right across from the Sainte Chapelle. Now, a Café Brasserie is basically a large restaurant that is open all day long and serves food from early in the morning until late at night, and you can get anything you want from just a coffee to a warm meal. Most of the time people tend to want either a salad, or steak-frites, which is the famous simple dish that people eat a lot in France, or a croque monsieur or croque madame which is a lovely French version of the grilled cheese sandwich, with or without ham or with or without ham and an egg. And you can also get sandwiches, or crêpes, which are the very thin, very good kind of pancakes the French make. And those you can actually take out with you and then you could either sit in a park or there are some benches in front of the cathedral. So if you don’t want to sit down and have service, you can do that. They are all pretty much the same price. It’s a little bit pricey, but not a whole lot considering how touristy it is. So, it’s up to you. There are lots of people who eat there. One of the good things about it is that service is really quick, they have so many people that they don’t care about you lingering there, and they are very quick to come to your table, take your order, and serve you. This is good to know because in other parts of the city at other times you might have a very slow service at a restaurant. And it’s good too if you’re travelling to Paris with children to know that you can get the crepes and a sandwich and drinks and go sit in the park which sometimes is easier for them. There is one more thing I’d really like to say. There are lots of bridges on the island and it’s fun to walk around because from Ile de la Cité you can go on a very beautiful little foot bridge that takes you to the other little island on the Seine river, and that island is called Ile Saint Louis, named after the French king Saint Louis. This is a very posh little area of Paris. Lots of little houses all of them designed and built all at the same time in the 1600, it’s still a very very fancy part of the city. Very small with very narrow streets that have some lovely little shops. Talk about boutiques that you might want to go into on a shopping outing, you can do it there. It’s a great place to go if you don’t have anything specific you want to see after you’ve seen everything on Ile de la Cité, it’s great to wander over there. And there’s a very famous ice cream place called Berthillon, the family Berthillon started it and everybody in Paris knows about Berthillon ice cream. And you can also go get a coffee at one of the two cafés that sit on the corner of Ile Saint Louis that face Notre Dame and have a view. On a beautiful sunny day it’s just a great thing to do. And it’s really nice to do the two islands together because it really gives you a feel for a major section in terms of time of the history of Paris. You go from really the oldest part to basically the Renaissance, which is where you have a lot of very posh buildings that are still everywhere. This started as a posh neighborhood and it still is, there are famous actors and writers and politicians, that’s where they have their houses. You and I unfortunately I don’t think we’d be able to live there. Annie: And what about the shops there? Are they mostly places like Cartier and such? Elyse: No, not Cartier, there are some little antique stores, some jewelry stores, one hat store, there aren’t very many, it’s mostly residential, it’s very small, but there are some restaurants too, and nice places to do window shopping in. 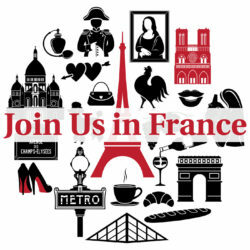 Please leave us a review on iTunes and if you’ve been to any of the places we mentioned here, leave us a comment on the web site joinusinfrance.com episode 2. Music credits Rémy the musical engineer. Thank you Rémy!